Global optics brand, Samyang Optics (http://www.samyanglensglobal.com) announce a new VDSLR 16mm T2.6 lens, designed specifically for video shooting with uncoupled gear rings with T numbers. This launch adds one more VDSLR cine lens to the existing 12 lenses for DSLR cameras. 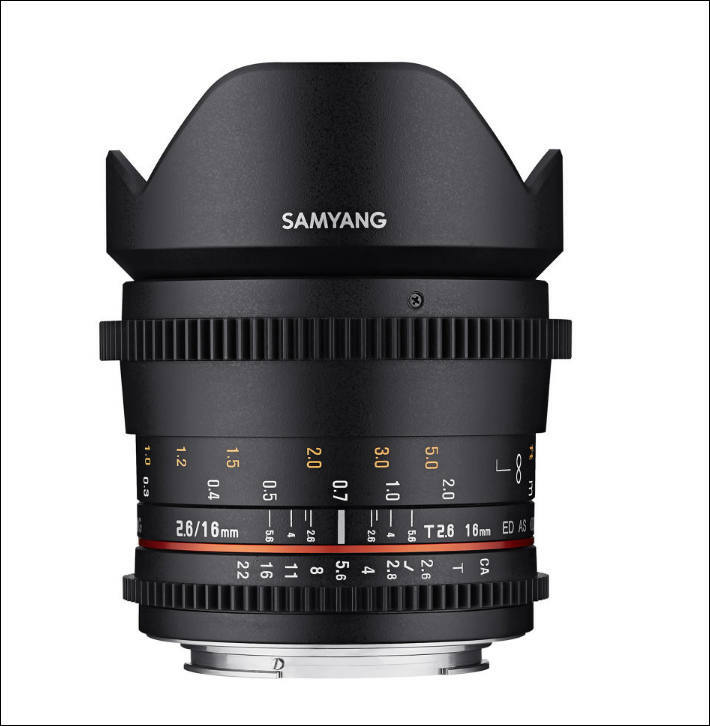 Since 2012, Samyang Optics has released its VDSLR lenses based on the needs of professional videographers. Satisfied with the image quality of Samyang manual focus photo lenses, videographers required the brand to customize the lenses with uncoupled gear rings and T numbers for follow focus system and maintain the image quality. As a result of this new launch there is now a total of 19 video lenses: 13 for DSLR cameras and 6 for mirrorless cameras. Inheriting the renowned image quality of Samyang’s wide-angle lenses, the new VDSLR 16mm T2.6 completes the VDSLR cine lens line-up. This angle of view is commonly used by directors of photography around the globe for its versatile usage for wide-angle, emotional scenes in film and videos. Along with the existing 14mm, 20mm and 24mm, this new 16mm lens will realize the delicate changes in the scenes. As a ‘Total Imaging Solution’ optics brand, Samyang Optics now offers 51 lenses: 2 premium XP photo lenses, 2 autofocus lenses, 19 manual focus photo lenses, 19 cine lenses and 9 professional video-cine lenses specifically under the XEEN brand. "14 glasses in 11 groups are used to create the utmost cinematic creative." Anyone know how to translate Samyangese?